Peel and chop two mangoes. Grind almonds into fine powder. Blend mango pieces and cottage cheese with granulated sugar to make puree. Reserve a little mango puree for garnish. Grind the biscuits with almonds coarsely in a blender with butter. In a large bowl and add mango & cottage cheese puree, some almond powder and mix well. Take small serving bowls or glasses and add a tablespoon of coarsely ground biscuit. Pour a ladle of mango mousse over it and add another layer of biscuit. Finish it with mango mousse, a little fresh mango pulp and a few chocolate chips. Refrigerate the Mango Mousse for 3-4 hours and serve chilled. 1. Combine all the ingredients and blend into a smooth purée in a blender. Refrigerate. 1. Drain and wash the soaked Kabuli chana. Add fresh water and salt and pressure cook the Kabuli chana for 3 to 4 whistles till they are soft. Cool completely. 2. 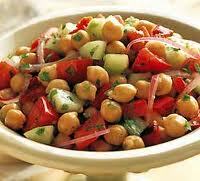 Combine the Kabuli chana with the remaining ingredients for the salad. Heat one teaspoon oil in a pan and roast gramflour on low heat till fragrant Transfer it into a bowl. Add yogurt, roasted cumin powder, crushed black peppercorns, kasoori methi, turmeric powder, garam masala powder, lemon juice, salt and saffron (if using) and mix well. Add the paneer pieces and toss gently and set aside to marinate for ten to fifteen minutes. Take satay sticks. Arrange marinated ingredients in the following order: onion, paneer, green capsicum, red capsicum, paneer, onion. Repeat for the other sticks. Heat a shallow pan, drizzle some oil and place the satay sticks on it. Cook turning the satay sticks from time to time so that the paneer pieces are cooked with even colour. Serve hot with mint chutney. Paneer tikka kathi rolls are vegetarian snacks, prepared with paneer and vegetable filling wrapped in a chappati or roti. The paneer is tossed with tomatoes in a marinade of curd, chili powder, turmeric, ginger and garlic along with fenugreek and chaat masala. the paneer is sauted with capsicum and rolled in chappatis. For the paneer tikka filling. Add paneer and tomatoes to the prepared marinade and toss lightly. Heat oil in a non stick pan, add capsicum and saute for 2 minutes. Add the paneer mixture and saute over a high flame for 4 to 5 minutes, stirring occasionally. For the chapatis Combine all the ingredients and knead into a soft dough. 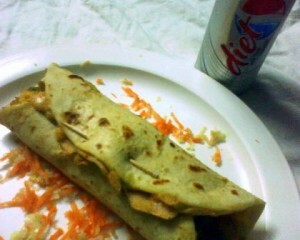 Roll out each portion into a thin chapati. Cook each chapati lightly on a tava (griddle) on both sides. How to proceed Divide the paneer tikka filling into 9 equal portions. Spread one portion of the filling in the centre of each chapati and roll up tightly. When you want to serve, cook the rolls on a hot tava (griddle). Cut into 50 mm (2″) long pieces and serve hot. 1. Heat the oil in a wok or frying pan on a high flame. 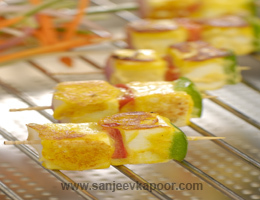 Add the paneer cubes and cook on a high flame for a few minutes till the paneer is golden brown. Remove, drain on absorbent paper and keep aside. 2. In the same oil, add the garlic, ginger and green chillies and stir-fry for a few seconds. Add the paneer cubes, tomato ketchup, soya sauce, chilli sauce and salt and mix well. 3. Add the cornflour paste to the mixture and cook for 1 to 2 minutes. 4. Serve hot garnished with the spring onion greens. Parathas made of paneer and spring onions. Cooking Time : : 15 mins. Preparation Time : : 10 mins. 1. Combine all the ingredients and knead into a soft dough using water. 2. Divide into 6 equal parts. 3. Roll out each portion into a circle of 125 mm. (5″) diameter. 4. Cook each paratha on a griddle (tava), smearing a little oil, until both sides are golden brown.